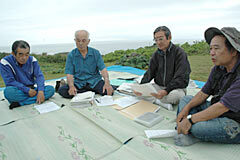 On April 15 at Hedo Cape in Kunigami after cleaning up the reversion movement monument members of the group held a meeting to discuss the reversion. On April 15, a discussion group consisting of former politicians and teachers involved in the reversion movement carried out their annual clean-up and repainting of the movement monument at Cape Hedo. Afterwards a meeting was held to discuss the fact that 40 years have passed since the reversion. The participants commented that U.S. military bases still remain in Okinawa and nothing has really changed apart from their passports. In 1995, the repainting of the inscription of the monument was initiated by a leader of the group, 76 year-old Kazuo Uehara, who was concerned about letters the fading away. Besides Uehara, residents of Kunigami Village and Ogimi Village Hiroyasu Chibana, Seiji Yamashiro, Hironobu Ota, Kenichi Kinjo, all in their sixties and seventies, participated in the meeting.